The numbers are epidemic?more than 60 million Americans have prediabetes or diabetes?and the complications (heart disease, blindness, kidney failure) can be devastating. But they are not inevitable, says Anne Peters, M.D., who, in Conquering Diabetes, explains how prediabetes can be reversed and diabetes can be conquered. Millions of afflicted Americans are confused, frightened, and often receiving sub-par treatment from inexperienced primary care physicians. As a university-based researcher and clinician, Dr. Peters is at the forefront of the latest developments in the prevention and treatment of the disease. 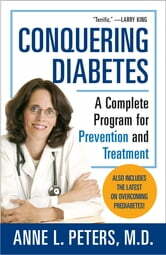 Conquering Diabetes offers readers a complete program, including what foods to eat/avoid, which medications help/hurt, and how to get the best treatment from your doctor.
? 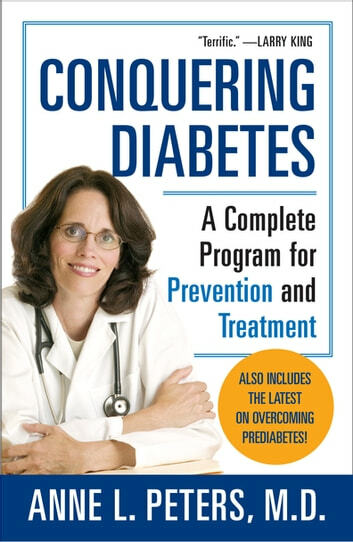 [When] I was diagnosed with diabetes, I immediately sought out the best, Dr.Anne Peters.? ?An excellent first-step resource for diabetics and prediabetics alike. ?